On the 15th October, 3,000 people protesting against economic inequality and corporate greed gathered in the square outside the London Stock Exchange, near St Paul’s Cathedral, with the aim of occupying it. Police prevented that from happening. The Occupy London Stock Exchange (OLSX) protesters then turned to St Paul’s Churchyard, the square in front of the cathedral, planning to set up camp. By the third day, more than 100 tents were set up. On the 28th October, St Paul’s Cathedral and the City of London Corporation decided to take legal action to evict the protesters, and it was this decision that led to a frenzy of activity on social media networks, and Twitter in particular. It was good to see that the City of London Corporation actively engaged in the dialogue by replying to individual Tweets in an attempt to correct misinformation and misunderstanding, and to direct users to official statements. Two separate stories Bought Northampton Borough Council into the social media spotlight this month. The first was the tragic events in a city centre nightclub on the 19th October, in which two people died and which have led Northampton Borough Council to temporarily suspend the nightclub’s licence while an investigation takes place. The second was the surprise resignation of Leader David Palethorpe just a week later – made all the more dramatic by the fact that it was announced via Twitter. Npton_Labour Cllr Mason [Labour leader Councillor Lee Mason] shocked at resignation saying the Tories are clearly divided and fighting each other like rats in a sack. Npton_Labour Seriously I’m finding the use of twitter amongst Npton political establishment has surged in the last few days. Hardly surprising, when it has become the communication channel of choice for political breaking news! The BNP responded by accusing the authority of blocking free speech, and this view was echoed by many in social media networks. The meeting was subsequently moved elsewhere. Looking back over the past 12 months, it is interesting to note that the overall volume of buzz is now relatively flat month-on-month, indicating that social media usage has reached a plateau, for now at least. This month, a new study by the Center for Marketing Research at the University of Massachusetts Dartmouth found that for first time in the past 4 years there is virtually no change in Fortune 500 companies adopting Facebook, Twitter or Blogging. Could this be a reflection that most of us have each reached our own personal plateau, and we have each come as far with social media as we are likely to come until the “next big thing”? This plateau is reflected in all of the different sources. PublicServiceMonitor images and chart data may be used provided PublicServiceMonitor is credited accordingly. About PublicServiceMonitor – PublicServiceMonitor trawls the Internet 24 hours a day, seven days a week, searching through news, blogs, forums and social media sites. It reads through all of this information and summarises what’s being said about UK councils, and can even tell you whether the sentiment is positive or negative (similar to the election worm we have seen at #leadersdebate). The service was launched in December 2009 so is still quite early on, but by measuring a benchmark group of councils on a consistent basis we hope to be able to provide some national trend information relating to what people are saying about their councils – and how they choose to say it. Welcome to the review of GovMetric data for August 2011. 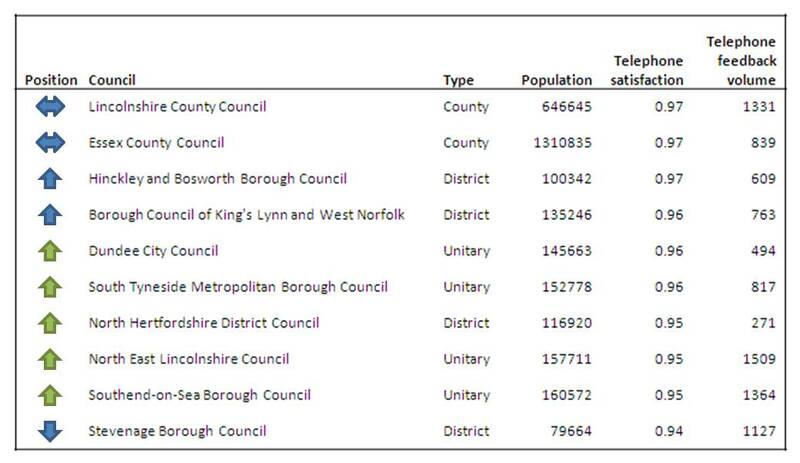 Well done to North Kesteven District Council, who take the top spot this month despite not appearing in last month’s top 10. South Northamptonshire, Mid Devon and East Hertfordshire all appear in this month’s index. Dundee City Council is the highest new entrant this month. 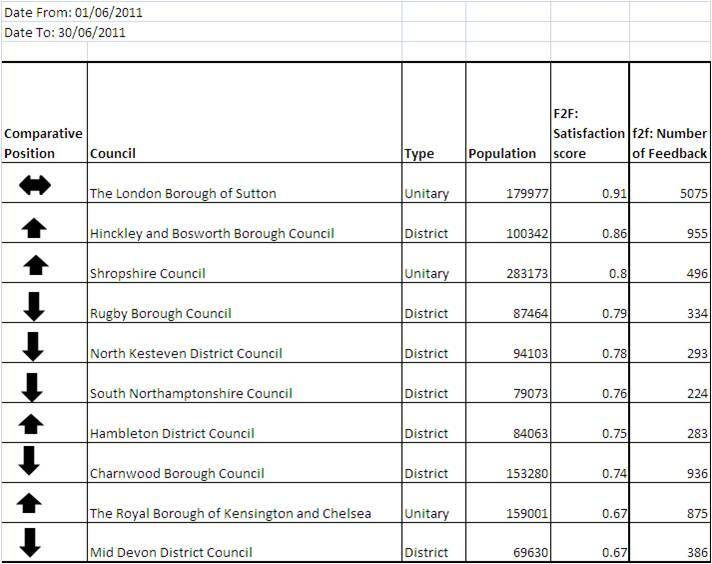 Well done to North Hertfordshire District Council – a great performance. The positions of the top six performers are all unchanged this month, with well over 20,000 pieces of feedback between them in just a month. That really is a huge amount of insight! We are very pleased to announce the winners of this year’s GovMetric Awards. Many thanks to all of you who made submissions, we were all very encouraged by the fantastic work our subscribers are doing to engage with customers and use their feedback to bring about real change- both in the way services are provided and on improving the culture and strategy of their organisations. Sutton have had an incredible year, spurred on by their gong last year they have gone from strength to strength. Again they have collected a staggering amount of customer feedback – over 94,000 individual ratings across the three main channels. Using their customer feedback in a variety of ways Sutton have been able to demonstrate the real value of customer insight in making improvements and they have learnt hard lessons from their customers by effectively using the service to monitor issues having a strong impact on the customer experience. They now have a strong commitment to really listening to the voice of the customer. We know that smaller organisations are different from large ones and they work in different ways, this is why we decided to open up our ‘Council of Year’ category and recognise the great work that some of the smaller borough and district councils are doing. Stevenage Borough Council have collected over 23000 feedback responses which is amazing given the population of the borough is under 80000. Stevenage are prolific across all of the three main channels and are relentless in striving for customer satisfaction. They know that you need to measure satisfaction consistently to better understand your customers. They have regularly appeared in our top ten in our Customer Access Index, and continually obtain excellent ratings from their customers. Having been in our top 5 for satisfaction in almost every month since we started publishing our Customer Access Index, and hitting number one on several occasions, Warwickshire are worthy winners of our Council Website of the Year. 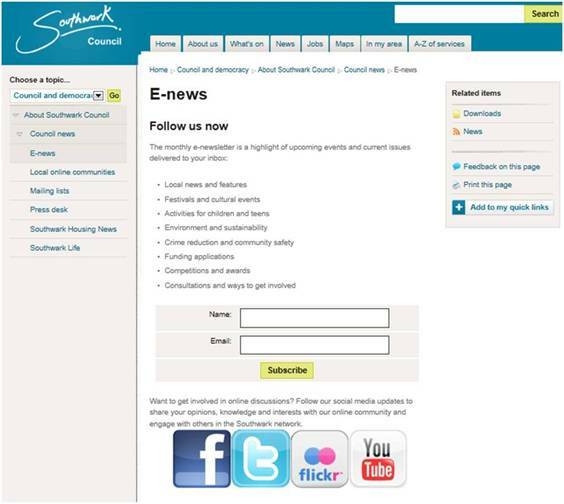 They have received more feedback on this channel than any other council and they have used the feedback constructively to fine tune their new website. They know that making little changes on the web and continually looking to make improvements, for which customer input is a huge feature, is the key to success. They value both the quantitative and qualitative feedback they receive through GovMetric and this is really driving their plans for the future. This year we decided to look at results based on the basic GovMetric service categories to see if we could recognise some excellent practices in a particular service area. This was a tough challenge as we needed to prove consistency as well as overall excellence. Hinckley and Bosworth Borough Council were our ultimate winners for their excellent customer ratings in the Council Tax category. Most of their feedback came from the face to face and telephone channels, so we know that the staff do a fantastic job and that the council provides a quick, informative service to its customers. Achieving an overall satisfaction figure of 94% which was an increase of almost 3 points on last year, they also managed to increase the feedback levels by over 4% too. Consistent, measurable improvement – just what we like to see! Both of these councils continue year on year to improve their use of GovMetric and make progress with the overall customer insight agenda. We were really impressed with the staff engagement work that Southend-On-Sea Borough Council have been doing, they actively educate and brief their staff in the importance of collecting customer insight, continuously measure individual staff involvement and have integrated this into their formal appraisal processes. Most importantly we can see that staff have better visibility of the entire insight process, from collection, to analysis and accountability for responding to feedback. At The Royal Borough of Kensington & Chelsea GovMetric has become well embedded in their operations, and they have worked hard on incorporating customer insight into their KPIs and the organisation’s “vital signs”. Add to this further improvements in staff training and mentoring, making better use of data and analysis of comments, and progressive feedback throughout the organisation, RBKC are definitely getting it right! Dundee City Council have been using Govmetric for over a year. They had a slow start but they know how important it is to be listening to customers. They now have a structured approach to monitoring take up and have empowered the staff to use the techniques that work for them when engaging with customers. This has resulted in much more useful data and some great responses from customers about the staff themselves. We recognise that the team at Dundee have put in a lot of hard work this year to really embed GovMetric into their everyday responsibilities. Both of these teams have been through significant changes in the last year but we were impressed with their commitment to the customer and the team spirit that has prevailed! We are always on the look out for ideas for promoting GovMetric. Raising awareness, communicating key messages to customers and generally encouraging them to participate is vital on all channels, but on the face to face and web channels we have an opportunity to do this through a visual means. Signposting and clearly explaining to customers the importance of their feedback and how you use it can easily be done through articles, posters, signs and displays. Earlier this year The Royal Borough of Windsor & Maidenhead created a presentation which is shown on their LCD screen their Customer Service Centre. The presentation is simple but very effective, and shows video footage of customers giving feedback and reinforces the importance of customers telling us what they think. Along with some other promotional work RBWM have significantly increased the number of responses they receive on the face-to-face channel. Finally, thanks to Colchester Council who kindly hosted the East Region User Group this month. It was a really enjoyable and valuable day, with a jam-packed agenda. 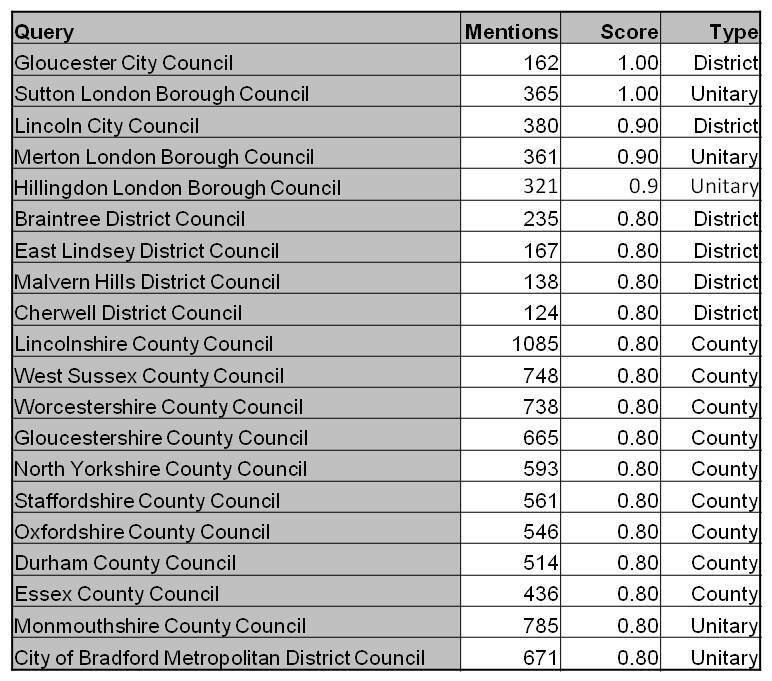 Gloucester City Council and Sutton Council, who have both appeared before in the Top 20, reach the top of the sentiment chart this month. 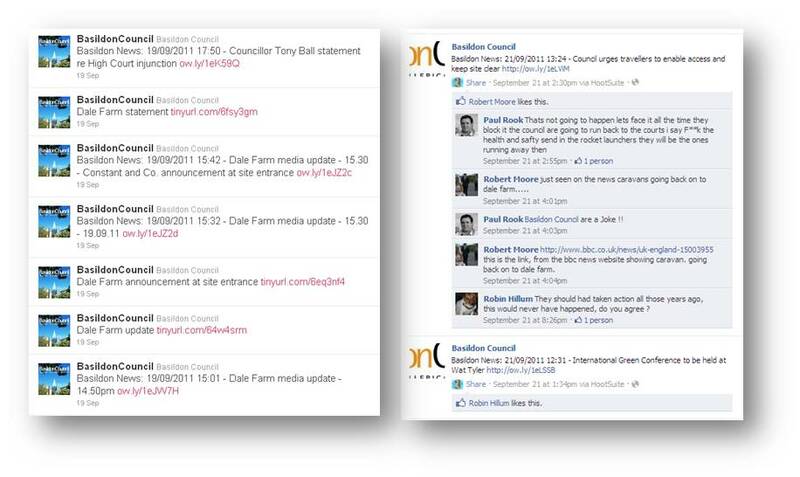 The single biggest story in social media this month was without a doubt the clearance of Dale Farm by Basildon Council. The six-acre plot of land in the village of Crays Hill has been used as an unauthorised traveller site since 2001. In July 2011, Basildon Council issued a notice to the travellers to vacate the site, and the weeks that followed the travellers fought back. The arguments on both sides are not new – angry residents complain illegal camping, damage and disruption, while travelling families complain they’re continually moved on by police and bailiffs and subject to constant prejudice. The strength of feeling involved on both sides has inevitably led to an explosion in social media buzz. The story peaked on 19th September when the scheduled clearance was halted by a last minute injunction. The day’s events saw Basildon Council ‘trending’ on Twitter for nearly 8 hours – in itself extremely unusual for a council. However, this was dwarfed by the #dalefarm hashtag that has been adopted by Twitter users on both sides of the battle, and which has been used to express extreme views that many commentators say have crossed over into outright racism. 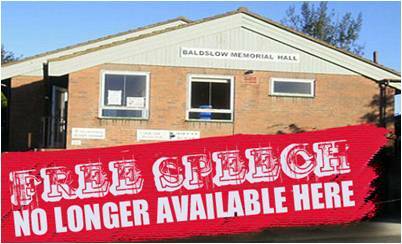 This places Basidon Council in a difficult position – how to use social media to inform citizens about events at Dale Farm, and to educate people about the Council’s legal duties, without being dragged into a dirty debate? Basidon Council has responded by broadcasting frequent updates on its website, facebook page and via Twitter, but it appears to have steadfastly refused to enter into any kind of dialogue in these spaces. This seems to be a pragmatic approach in sensitive circumstances. It would be wise to remember that a big story like this one will shine the social media spotlight into other corners of your online presence that otherwise might have gone undiscovered. We won’t name any names, but in researching this story we came across tweets from individuals associated with the Council that we cannot imagine were ever intended for public consumption. Make sure that your officers and Members understand the difference between an @reply and a direct message. Although they are directed at a specific user, @replies are PUBLIC and will appear on the twitter timeline for all to see! If you want to say something privately on Twitter, you MUST use a direct message. To finish… this is the last Reputation Index to be published under the CouncilMonitor brand! In response to growing demand, we are broadening the scope of our reputation management solution to include all public services, not just local government. So this month it seems appropriate to take a quick look at a story from the wider public sector – in this case, the police. LGC reports that an independent review of the riots in Wandsworth that saw unchecked lawlessness in Clapham Junction has called on the police to review its use of social media after officers ignored warnings that the area would be a flashpoint. Twitter usage continues to grow – just look at how it has roughly trebled its share since this time time last year. CouncilMonitor images and chart data may be used provided CouncilMonitor are credited accordingly. About CouncilMonitor – CouncilMonitor trawls the Internet 24 hours a day, seven days a week, searching through news, blogs, forums and social media sites. It reads through all of this information and summarises what’s being said about UK councils, and can even tell you whether the sentiment is positive or negative (similar to the election worm we have seen at #leadersdebate). The service was launched in December 2009 so is still quite early on, but by measuring a benchmark group of councils on a consistent basis we hope to be able to provide some national trend information relating to what people are saying about their councils – and how they choose to say it. Welcome to the review of GovMetric data for July 2011. 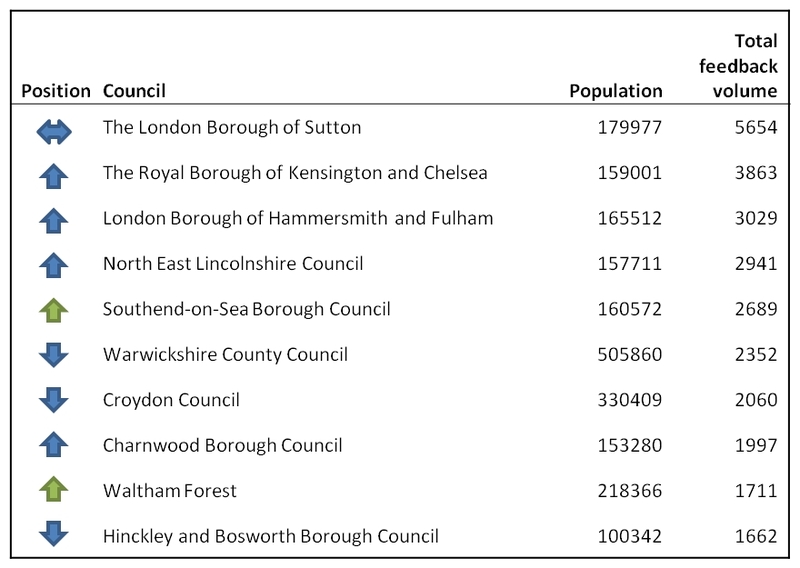 Essex County Council is a new entry into the overall top ten. The top three councils remain unchanged. 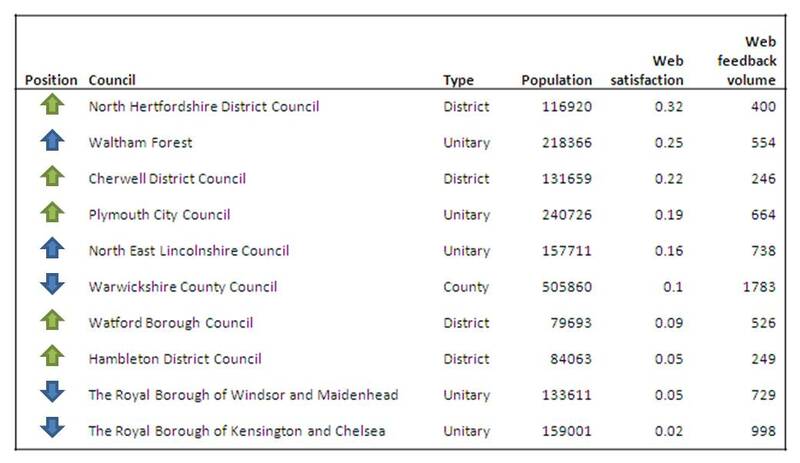 Harborough District Council and Southend-on-Sea Borough Council are new entries in the index. It’s all change this month, with six new entrants in the table. 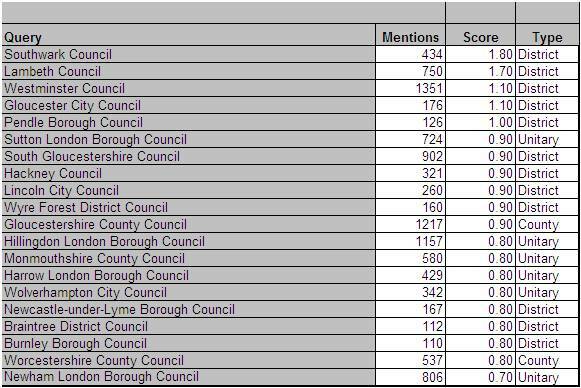 Lincolnshire County Council maintains its position at the top of the index. There are several new entries this month, with Kensington and Chelsea placed as the highest new entrant. 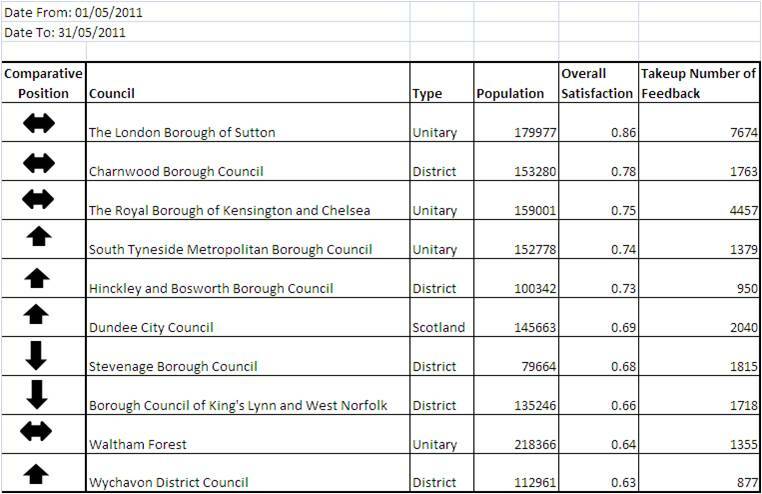 Southend-on-Sea and Waltham Forest Councils have made a new entry in the index, and The London Borough of Sutton has maintained the top position with nearly 6000 pieces of feedback this month. Last week LGC featured an interesting article on channel shift, examining councils’ progress in shifting channels and the obstacles they still come up against. For those of you who missed it, the report (based on a survey carried out by LGC and Serco during August) included some interesting findings. The survey found that when it comes to how councils contact their service users, email is only marginally more popular than ‘snail mail’, with only 28% of survey respondents citing it as a one of their primary contact methods (compared to 24% for regular mail). When you compare this to the dominance of email in our own office communications, this result is startling, and certainly prompts the question “why?”. Furthermore, the survey found very little evidence of channel shift to social media and mobile – channels that have been transforming the customer contact in the private sector. The growth in internet and mobile take up means that demand for these services cannot be far away; councils risk missing significant opportunities for reducing costs and improving customer access if they do not take these channel shift opportunities seriously, the report concludes. Understanding how well you deliver services by email is obviously crucial to improving customer uptake. You may not be aware that GovMetric can be used to measure customer satisfaction with emails, as well as the main three channels. If you are already a GovMetric user but are not yet using our email solution, why not give us a call to find out how it could help you? Welcome to the review of GovMetric data, this month we are looking at both May & June 2011. 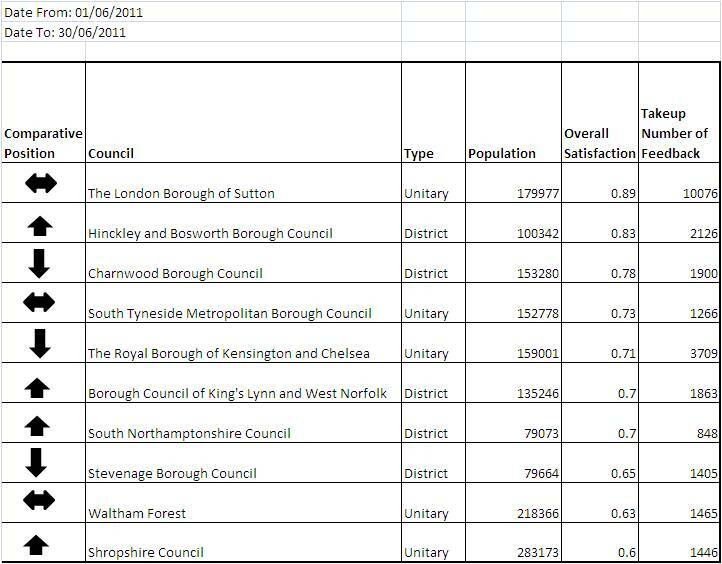 The first table looks at overall satisfaction on a multi channel basis. 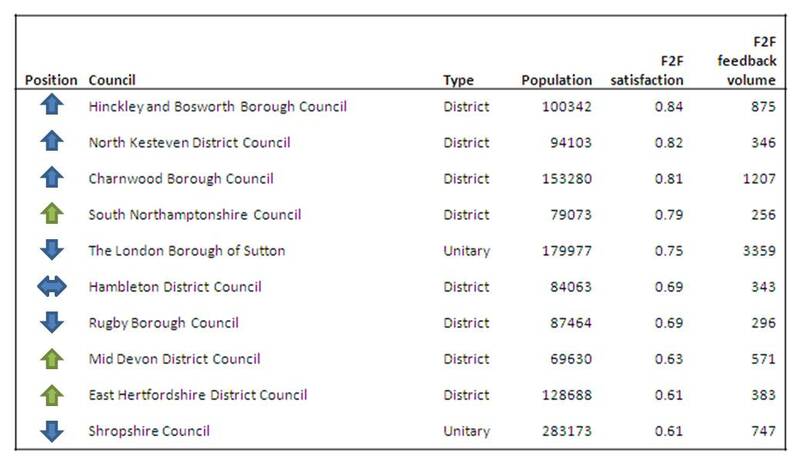 Hinckley and Bosworth Borough Council and Wychavon are new entries into the overall top ten. The three top performers remain in their positions. South Northamptonshire Council and Shropshire Council are new entries and Hinckley and Bosworth Borough Council have moved up three places in the index. North Kesteven District Council, Rugby Borough Council & South Northamptonshire Council are new entries and have ranked high in the index. 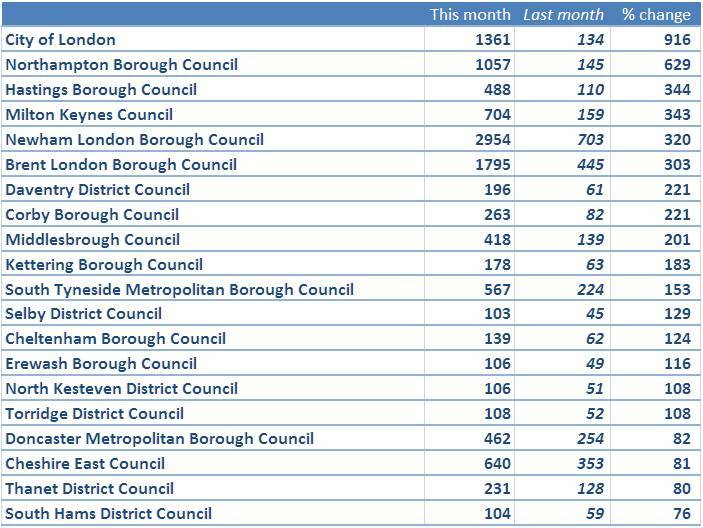 For the first time, this index contains all of the same councils as last month. Do we have a leading group emerging perhaps? We will have a look when we assess July’s data. 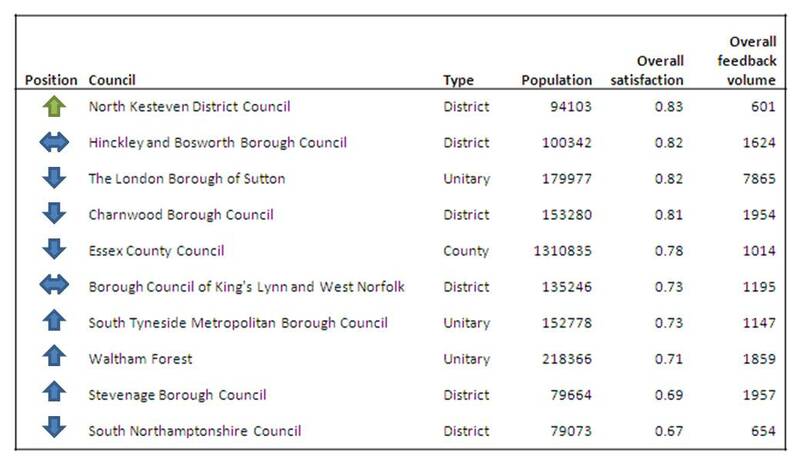 Wychavon District Council and South Tyneside Metropolitan Borough Council have made an entry into the top ten, a fantastic achievement in this channel. Charnwood Borough Council, Southend-on-Sea Borough Council and North Hertfordshire District Council have all entered the chart this month. 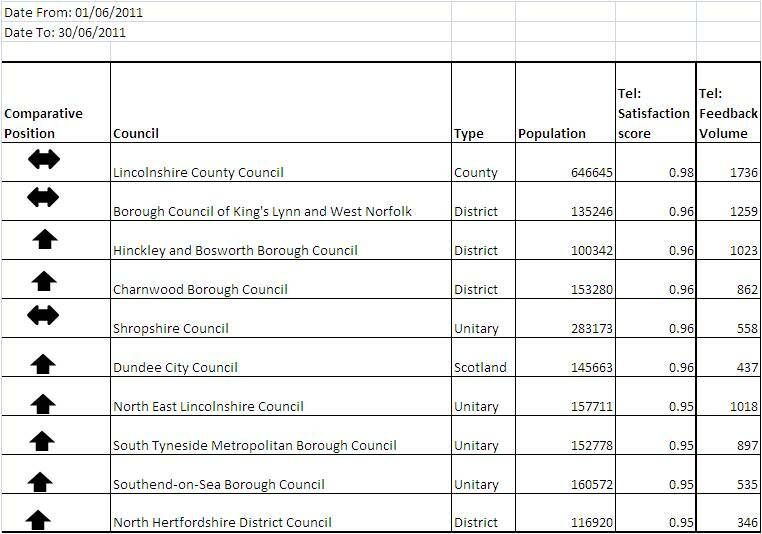 Lincolnshire County Council and Borough Council of King’s Lynn and West Norfolk maintain their position at the top of the index. The fourth table looks at customer satisfaction with the web channel. South Tyneside Metropolitan Borough Council, North Hertfordshire District Council and Stevenage Borough Council have all entered the chart this month. Congratulations to South Tyneside for going straight to the top spot! 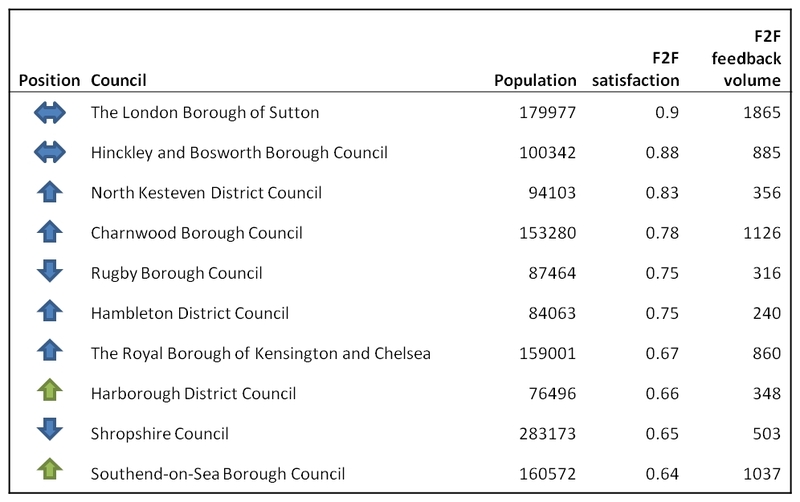 Croydon Council, Hambleton District Council and Leicestershire County Council are new entries into the index this month. 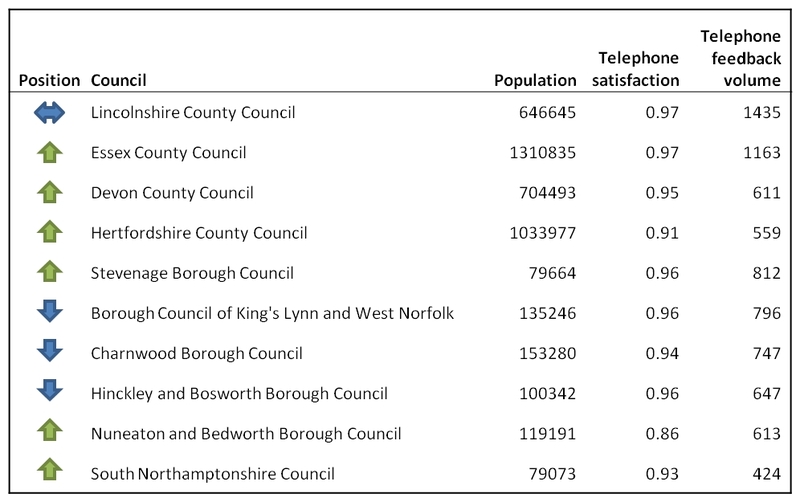 This is where we take a look at the 2 key charts from the national trends data – channel ratios and service volume trends for UK councils in the sample. The other chart we look at regularly is demand by service type. 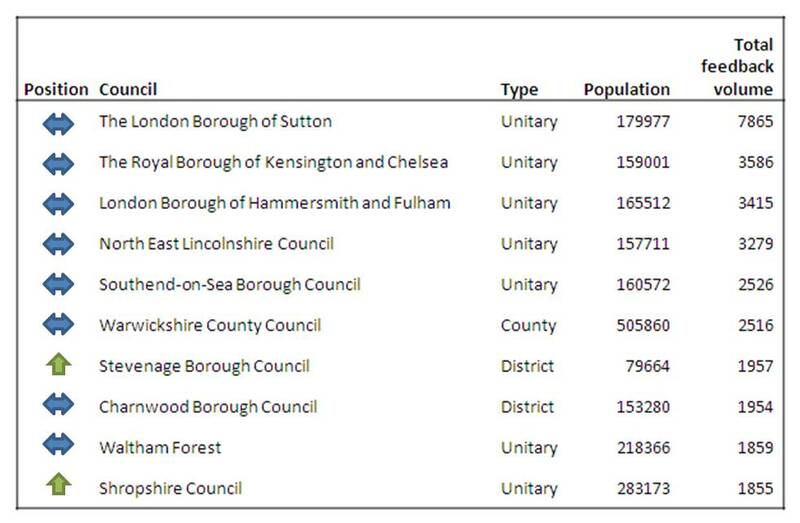 The monthly spotlights are calculated using aggregated data from 70 UK councils. The proposed methodology is this. For a demo of how GovMetric works please visit http://www.govmetric.com/demo . Make sure you have volume turned on! Have you got a Social Media Policy? This month’s Top 20 is a good example of how you can have a successful online presence no matter what your size. 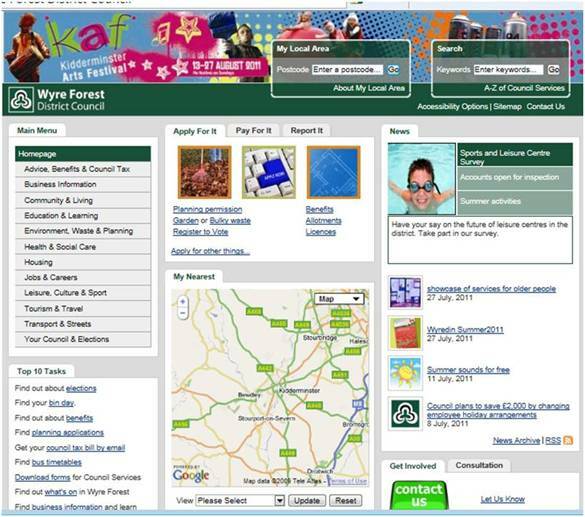 Let’s look at Wyre Forest District Council & Essex County Council and how they approach their online activities. Wyre Forest District Council have small but well managed Facebook and Twitter accounts. Their website is unusual compared to our other top performers as it does not promote their social media heavily. However it is a very informative, organised site and shows that their focus on informing customers on the web is a priority. 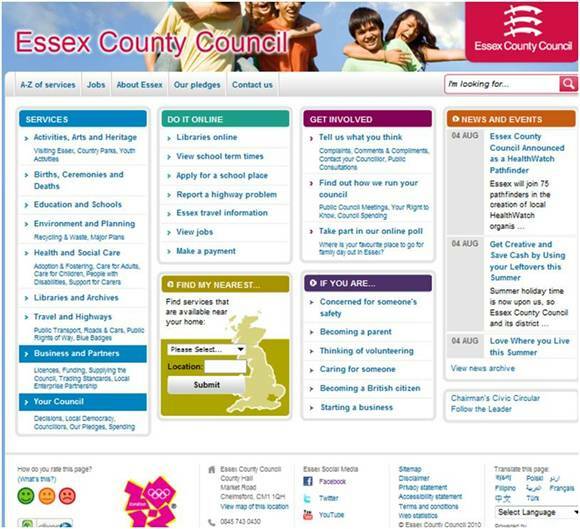 Essex County Council’s website features links to their social media accounts on their home page & it manages these accounts well so that they are able to achieve the score that they do with the high volume of mentions they receive. Have you got a social media policy for employees? More and more public sector organisations are developing a social media policy as part of their reputation management activity. 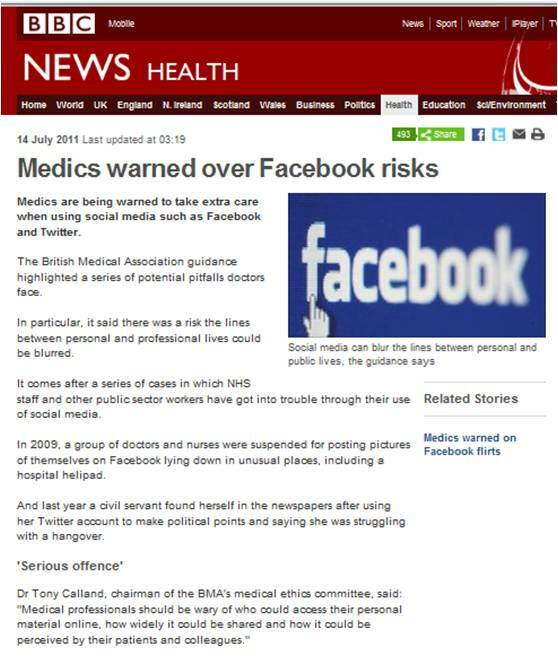 The British Medical Association’s recent steps to warn medics of the impact of including references to their professional life in their private social networking is one such instance. Monitoring mentions of your organisation is one way that can help your organisation know what is being said. A policy is another, do you have one? We can see that with the exception of the news channel, the other forms of media have reduced in the last month. Could this be as a result of summer holiday season? We shall see what August’s results bring. Images and chart data may be used provided CouncilMonitor are credited accordingly. 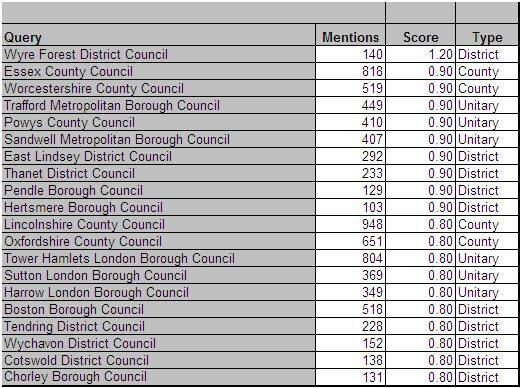 Congratulations to Southwark Council for achieving such a high score in the Top 20. A quick look online shows they have a commitment to social media communications, with clear signposting on their website and a good audience on the platforms managed by an e-communications team. We have seen examples of public sector organisations using Twitter to raise awareness of what they do. 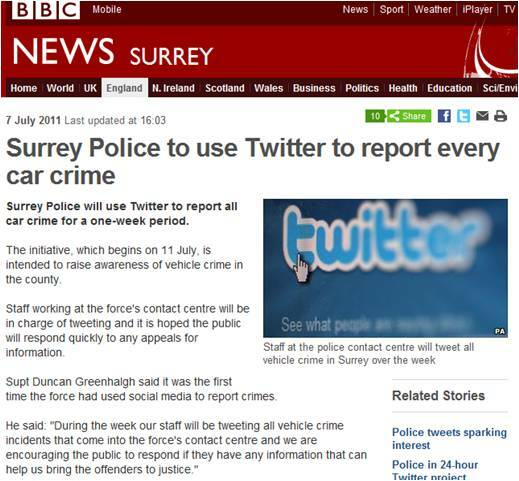 Surrey Police have developed this further by reporting every car crime in a one-week period on Twitter. This is an excellent example of using Twitter for a two-way dialogue. It is hoped that Twitter users can actually help the Police with their investigations. There must be many more scenarios where a process like this could lead to service efficiencies? The issue of controlling Twitter looks set to become more and more pressing, with the example below being another consideration that councils will need to take. 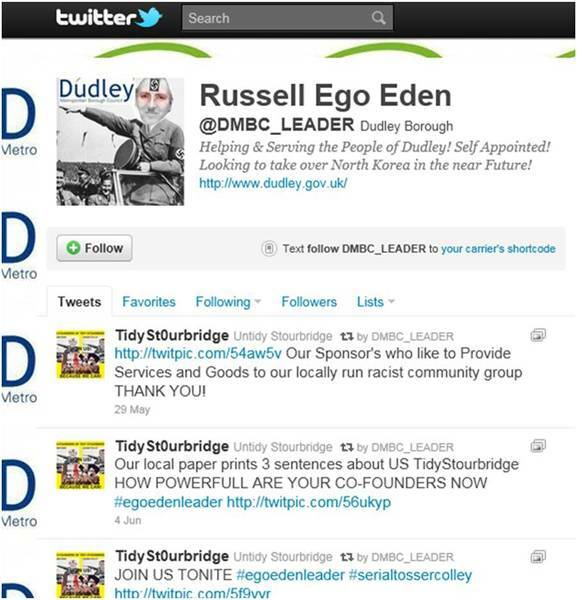 Many Twitter users coming across the username of @DMBC_LEADER would reasonably assume that this person is related to Dudley Metropolitan Borough Council, and may even follow this person’s tweets or accept a follower request. However, one quick glance on this Twitter user’s page and we can see that this is not something that any council would want to have associated with them. Yet this person is using the council’s logo and brand. Currently there is very little power to act on impersonators like this. Being aware that they are around and monitoring what they are saying is a start though. Twitter’s return to previous levels indicates that May, the month of the elections, provided a peak in this particular channel. This could suggest that a pattern to council and resident usage of the social media channels. For example, Twitter’s speed being effective for spreading election news and reaction. Online news has shown a further increase from last month. Council mentions on blogs have reduced in the last few months. We shall continue to watch this.